Whatever else there is to say about this CD, Duo Pianistico di Firenze who celebrated twenty years as a piano-four-hands ensemble in 2011, have done a simply superb job here in terms of their faultless playing and impeccable ensemble. This is all the more commendable, too, since this is not just a disc of lightweight miniatures, but a supreme challenge technically for both performers. The crux, though, is whether it was all really worth the effort, in terms of the music itself. 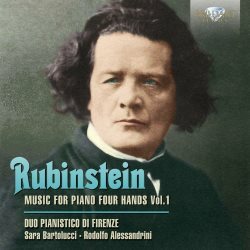 Essentially there are two components on this CD, the first of a projected set to include all the music for piano (four hands) by Anton Rubinstein. There’s the four-movement Sonata and the two sets of Characteristic Pieces. The present CD opens with the Sonata, and then follows with the other two sets, given chronologically. Just as with any recording – or indeed live performance – playing order, rather like a hand in poker, can have an important outcome both for the immediate impression this creates and the lasting one for the listener. Clearly from Bartolucci and Alessandrini’s sleeve-notes – which Elizabeth Hancock has made a good job of translating faithfully into English – one reason for going with the almost thirty-six minute Sonata first, might be the esteem in which the Duo holds this work. They write: ‘The Sonata Op. 89 is the first great sonata for piano four hands, and perhaps the only vast cyclic composition for two pianists in the Russian repertoire’. Two things stand out here: firstly, in terms of sonatas for piano four-hands, the vast majority of sonatas per se come from the Classical period, with Mozart providing the greatest number. Those specifically from the ensuing Romantic era – which would embrace Rubinstein’s work – include examples by Hermann Goetz, Kalkbrenner, Moscheles, and Mussorgsky, so, and with no disrespect intended, hardly pre-eminent names in the history of music. Secondly, although of minor factual importance, Rubinstein, while Russian-born, writes in pure Germanic style, rather than exhibiting any of the traits of Russian nationalism seen in the works of ‘The Mighty Five’ – Cui, Borodin, Balakirev, Mussorgsky and Rimsky-Korsakov. Even though Mussorgsky’s early sonata is incomplete, the second movement is eminently more ‘Russian’ in character than anything in the Rubinstein. The opening movement is almost sixteen minutes long, and while there are indeed some quite purple patches in the quality of the writing, there are also parts which could be pruned to good effect, to stop the piece – which the Duo describes as ‘a rhapsody, although contained within a classic sonata form’ – from sounding somewhat rambling and amorphous. The second movement is an effective Scherzo which hints both at Mendelssohn and Beethoven, combined with suggestions of the ‘Dies Irae’ in the bass, and has a more pastoral trio. The third movement is described as ‘extremely innovative in that it has no real final Allegro’. In practice what this means is that, for almost nine of its nearly twelve minutes’ duration, it functions as a conventional slow movement, before tacking on unchanged the same ‘Allegro assai’ coda from the first movement to bring about a somewhat more resounding finish to the sonata overall. Yes, in one respect, the word ‘cyclic’ mentioned above might seem justified – or perhaps Rubinstein just wanted to bring this lengthy work to a close in the most expedient fashion – by attaching ‘something he’d made earlier’, rather than coming up with new material. In fact, while the Duo definitely seems to want to promote all the composer’s output in the genre, and the Sonata for its own sake, even they appear to have some doubts in their closing paragraph: (The Sonata is) ‘too difficult for amateurs, snubbed by the concert performers because it is not for soloists, too long for the general public, too melodious for musicians. But if you have the patience to listen to it without prejudice you will find that it is full of beauty, as is all Rubinstein’s music’. Essentially, then. the choice is yours. Frankly I find these pieces more attractive, and even in the opening Chanson Russe, there is a certain ‘Russianness’, or at least East-European nostalgia, which is nowhere to be heard in the Sonata. True, the other two pieces – Nocturne sur l’eau and La cataracte respectively, are very much in the vein of the typical ‘characteristic piece’ written by many a composer for the medium. Equally, the way that, in La cataracte, the melody is nearly always in octaves in the ‘primo’ (top) part, might suggest its conception as a teaching piece for student and teacher. While the Six Characteristic Pieces, Op. 50 are chronologically, if not musically-speaking, quite ‘The work of an expert, mature and responsible maestro’, again they make for pleasant and easy listening. The opening Nocturne is nicely melodious, while the Scherzo has almost the Italianate quality and nimbleness of the Tarantella from Mendelssohn’s Italian Symphony. The Barcarolle is perhaps now better known in a version for solo piano. The Capriccio is again attractive, in the salon-style of Moszkowski, while the Trio, with its syncopations, suggests the similar movement from Beethoven’s Sonata in E flat, Op. 31 No. 3, which Saint-Saëns used to great effect in his Variations on a Theme of Beethoven, Op. 35. Interestingly, here Rubinstein reprises the Trio after the return of the scherzo-like main theme of the Capriccio, thus producing an A-B-A-B shape. The Berceuse has a main theme again cast in a melancholy C minor, which does have a very slight Russian feel to it, while the central major-key section is suitably passionate. There is a very short chorale-like coda to end the work in the tonic major key. The final March provides both a fine pianistic conclusion to the set, as well as the CD as a whole, and is vaguely reminiscent of the opening movement from Rachmaninov’s Suite for Two Pianos, Op. 17. It’s certainly not difficult to feel the two pianists’ great sense of achievement and accomplishment as they coincide triumphantly on the unison which closes the piece. In the final analysis, while I think that Duo Pianistico di Firenze’s obvious, and undoubtedly genuine enthusiasm for the music of Anton Rubinstein is well-intentioned, for me the Characteristic Pieces (Melodies) are actually what Rubinstein does best. By contrast, the over-long Sonata is structurally wanting, and perhaps distinguished only by its length and the players’ necessary powers of endurance, in a field where there are but few claims to fame. Given that the CD is extremely competitively priced, the Steinway piano superbly recorded and the playing is of the very highest order, this disc of attractive and unfamiliar piano music for four hands is well worth acquiring.